Convert your garage or basement into a batting practice station! Can't make it to the ballpark or the batting cages? Get a ZipNet and practice right at home! The Zip Net is a perfect batting practice tool that works great in the garage, basement or the backyard. 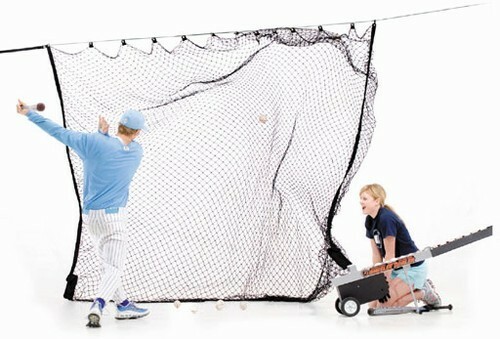 The ZipNet works especially well with batting tees or a soft toss machine such as the Wheeler Dealer (shown in photo below). The ZipNet is guaranteed to withstand everyday use for 3 years! Drop a water bottle in each corner pocket for weight.